Like this, .when trying to be continuously connected. I saw a comment about how the device is not good when moving. hey it's for MOBILE! You can Pm me if you feel communication would be quicker.. Try doing a PRL/Profile Update. Details are below. But the 4G coverage in Seattle is spotty like @njfulwider5‌ said previously. How do I update the 3G Profile and PRL on my MiFi 4G/3G? @njfulwider5 thanks I was confused because the user guide title says browser interface. As for the 5 dots indicating number of connected devices, with my ipad air lots of time is spent connecting to the mifi with very little data actually exchanged. the ipad is the only device connecting. eventually, on moving bus, there are 5 dots (all connections perceived by the mifi as different devices?? ) and the air starts asking for the password again. ... and again ... so even when there's a blue light there are big problems getting service. I'm back to "basically unusable"
You can downgrade on your last day or two of your cycle. Then you'll have 500 MB, 200 min, 500 texts free each month. Plus add 10+ FP friends for 500 MB more monthly. To downgrade the plan yourself. 2. Under your plan (data or voice), click on Detail and Plan Management. 3. 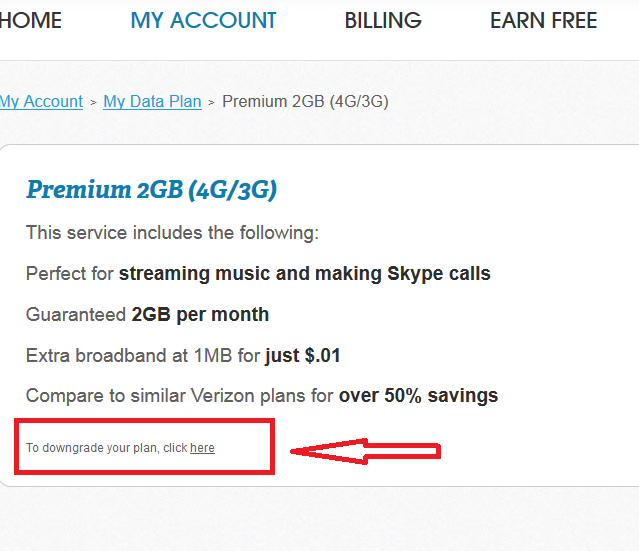 Click on the link (in very tiny letters below the plan "To downgrade your plan, click here"
4. Navigate a few prompts trying to get you to reconsider. 5. Go back to the plan page and confirm it is downgraded. Note: If you have used more than 500MB of data, down grading to the free plan may cause an overage for the billing cycle. In that case, wait until the last day of the billing cycle. --- @Ali‌ Will that work?